One of my very first posts ever was an ode to the many, many highlighters I owned and loved. Since then I've added even more to my collection, including what I consider to be the best highlighter out there: the RMS Living Luminizer. RMS Beauty is an organic line that is free of harmful chemicals and uses raw, food grade ingredients. RMS is carried in a few boutiques throughout the U.S., but it's also available on a number of online retailers (including Space NK, Dermstore and b-glowing). 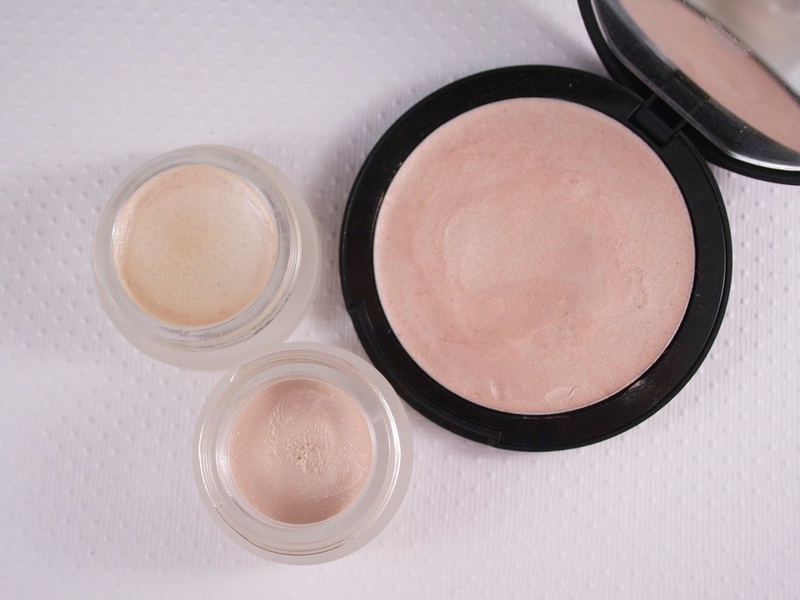 While it can be daunting to order cosmetics online without an opportunity to swatch or test them out beforehand, RMS is a superb line and their Living Luminizer is heavenly (and totally worth ordering). It is the highlighter I reach for 9 times out of 10. So, when Anna from Vivianna Does Makeup mentioned that the Topshop Glow Highlighter in 'Polished' was a dupe for the RMS, I had to try it out. You know, for science. Eek! Apologies for the low quality picture. I've discovered that cream highlighters are very tricky to photograph! 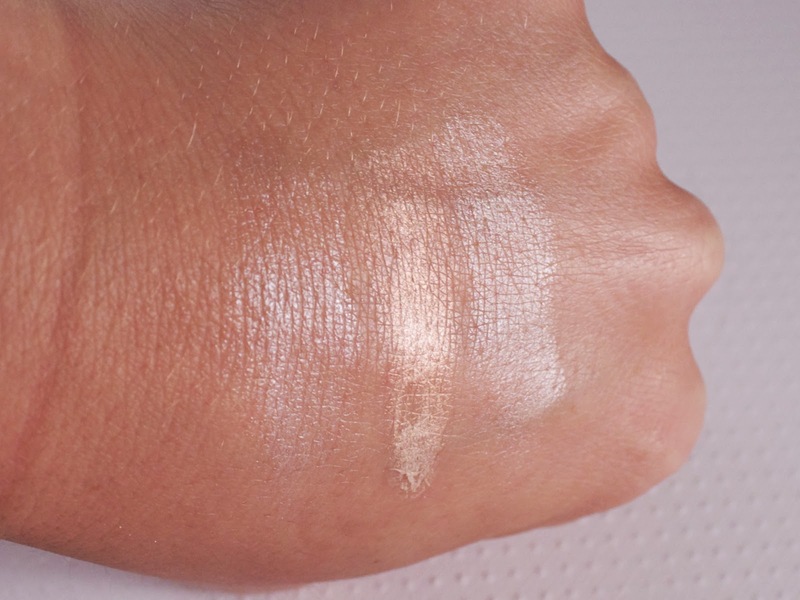 As it turns out, Topshop Glow Highlighter in Polished is quite dissimilar from the RMS Living Luminizer. It's not bad, but it is more of a traditional highlighter, whereas the RMS is on a whole 'nother level. The RMS Living Luminizer doesn't leave any noticeable color on the skin, just an absolutely radiant glow. It is quite honestly like nothing I have ever seen before. It contains no glitter, no shimmer, nothing of the sort. I really don't understand how or why it works so well, but it is stunning. To me, Polished is quite similar to the now discontinued Jemma Kidd Radiance Creme in Iced Gold (so if you have been lamenting the loss of that product, perhaps you should check out the Topshop). The Topshop is a bit more yellow in undertone than the Jemma Kidd, and is both more creamy in texture and more opaque. Both of these factors mean you will need to go in with a lighter hand with the Topshop. But if you do, they give a similar finish. I have always been able to use the RMS Living Luminizer, Topshop Glow, and Jemma Kidd over either liquid or powder products with zero problems. All three are good....but RMS really is the winner. So, if you have the chance to get the RMS, get it now! 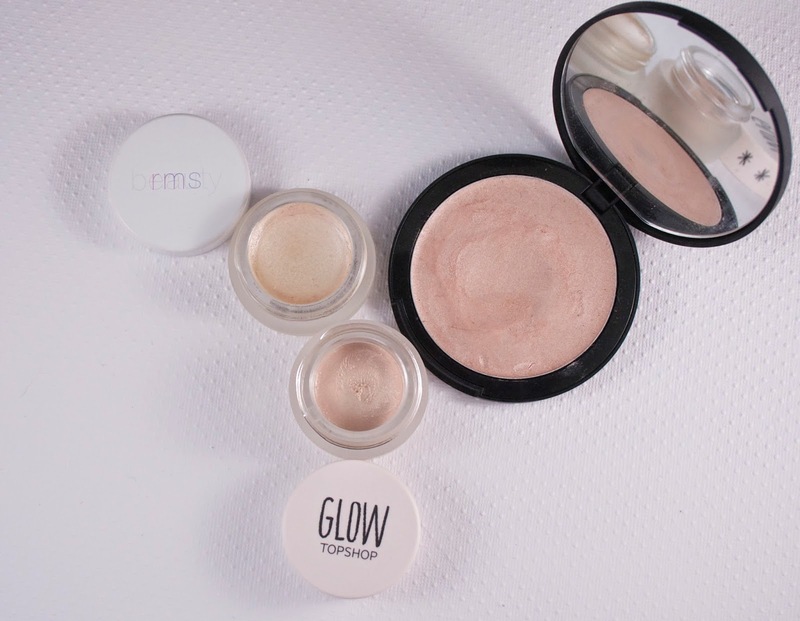 Have you tried any of these highlighters? Which is your favorite? Don't forget to follow me on Bloglovin, Twitter and Instagram!